If you want to „dine“ at McD and have coffee at Starb then go to Bali. If you want to surf some of the best waves then go to Bali. And from then on, the two seamen are busy handing beer up to the sundeck. 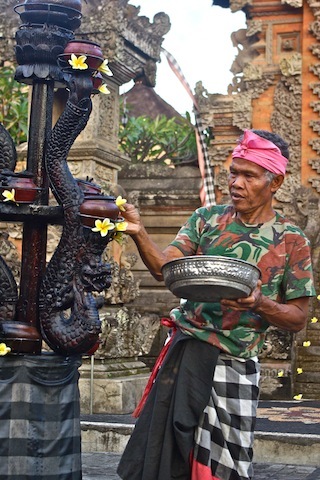 AND if you want to see spectacular Balinese dance and listen to Balinese music, then go to Bali, too. If you want to spend a night or two in an old Indonesian wooden house, then go to Dragonfly Villages at Ubud. And if you want to see an excellent art museum with a dazzling array of paintings from local artist, being Balinese or newcomers from all over the world, then visit the Neka Museum. 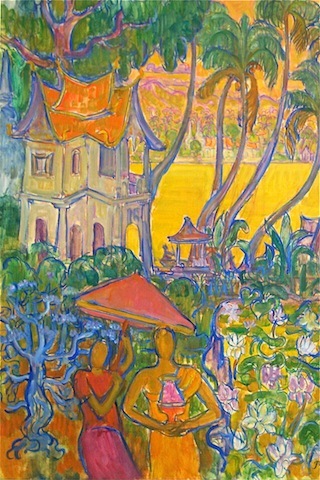 We were delighted to see paintings of an artist from Basel, our hometown, adopting our beloved German Expressionism to Balinese themes. And if you want to know why you should go to Lombok, then look at the photos No 13-16 from the Senggigi Festival in Lombok!